Christmas brings many emotions. I love the season, but usually find myself struggling with trying to make our dollars stretch far enough, find the extra time to do all the extra things, and enjoy the season without the extra stresses. Simply put- I often loose my perspective. Sunday nights have become "mommy's night" and normally I stay home while my boys go to Awana's and youth group. I usually end up at the grocery store, or running errands or folding laundry. It rarely ends up being a peaceful night, but it is usually quiet. This past Sunday night, I took a little trip to KMart to pick up some Melatonin for my boys. I watched the other shoppers fill their carts with gifts and decorations. Then, I got to the check out line, and in front of me was a couple....of grandparents. They had filled a couple of carts with Christmas gifts for their grandson. I know it was for their grandson because I heard them talk about it, over and over and over. On and on they went about their grandson, and Christmas morning, and oh what fun it was going to be. I confess, I got whiny. I thought back on my childhood- if I ever actually received a present from my grandparents, I sadly don't remember it. Then I thought about my own children- who have grandparents who love them- but have never, to my knowledge, bought cartloads of presents for them. I went home feeling more "poor" than before and a little more stressed wondering how we were going to "do" all that needed to be done. 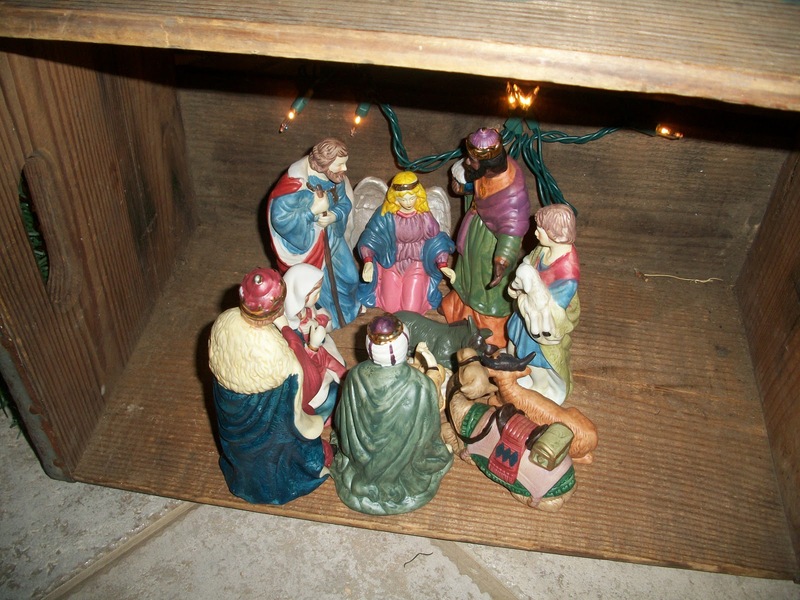 I was distracted by the worlds' perspective of Christmas. I arrived home to an empty house, and took advantage of the last hour of so of quiet to finish decorating the house for Christmas. I pulled out our nativity set, which I hadn't used the last couple of years. Let's just be honest- this year is the first year since Elijah and Isaiah joined our family, that is remotely close to the NORMAL we used to know. While the boys all walked past, nobody payed attention except Isaiah. He walked in the door and was immediately drawn to it. Isaiah's my "crasher" so my initial reaction was "don't touch- they will break" but I decided that if he wanted to play with baby Jesus, who am I to say no. He began to take it apart. He talked to them, calling them "buddy"- they were "in"- he would stop and clap. He started singing "glory to God" raising his hands in praise, and then every so often, would wipe his forehead, as if it were dripping with sweat. 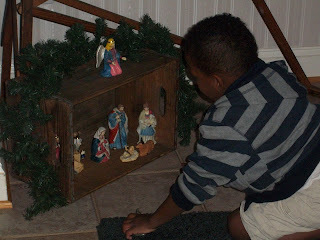 this is how he put them back- he told me "baby Jesus has to be in the middle so everybody can see him"
Got cold chills? I sure did. 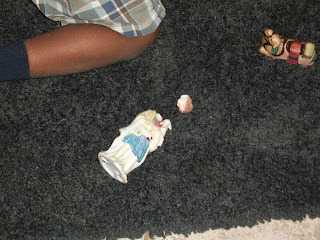 God spoke to me through my baby's play. I think he's got perspective. So how do we find peace, when the world is throwing all the wrong perspectives at us? Isaiah 26:3- He keeps him in perfect peace, whose mind is stayed on thee; because he trusts in Him. The only thing we can trust in, depend on- is Jesus. He won't fail us. This morning, before we could go to school, Isaiah had to stop and play, and when he was done, he made sure Jesus was in His proper place- the center. oh yea, we have a headless shepherd. But, that's okay. We are all broken aren't we? We come to Jesus, broken and ugly and with nothing to offer. 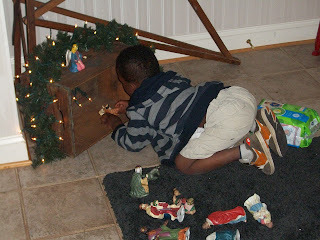 I'll glue the shepherds head back on then Isaiah will let him back into the group so he can look at Jesus too. And, because that baby boy grew up and willingly gave his life on the cross, 33 years later- He takes us in our brokenness, covers our sin with his blood and glues us back together. And, He keeps putting us back together, over and over and over- that's why we can put our trust in Him. That's how we can know peace. 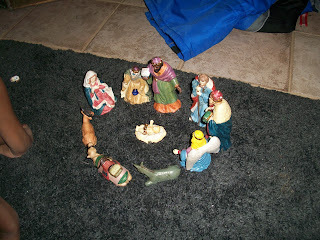 Keep Jesus in the center of your life and your Christmas! John 3:16- For God so loved the world that He gave His only Son, that whoever believes in Him will be saved! Praise Him, Praise Him, Glory to the Newborn King!!! Thanks for this. I was really encouraged by your perspective. It is definitely helpful to have visual examples of what really matters. Sure do love you!